Yeah, it’s autumn (ok, almost close to winter) and that means it’s pumpkin and soul food time! 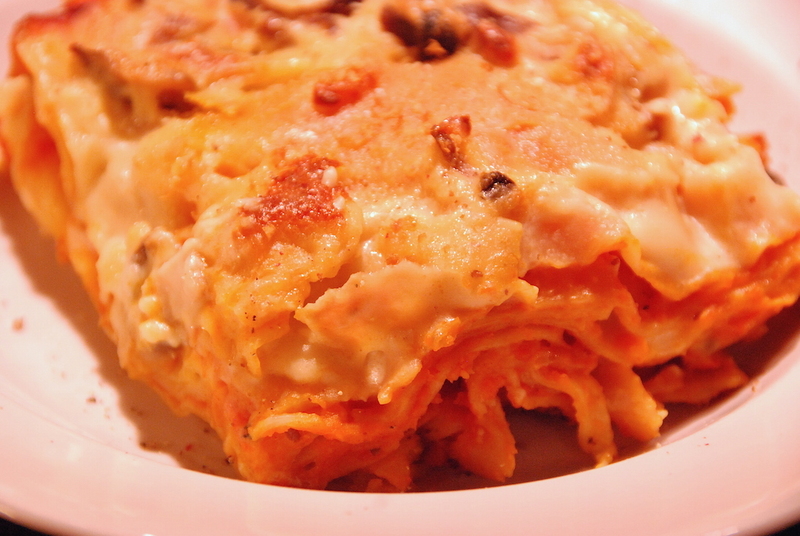 As I love lasagna, mushrooms and pumpkin, I had to throw everything together, top it with a creamy sauce and refine it with something special like cinnamon – et voilà, here’s a perfect warming and comforting dinner. 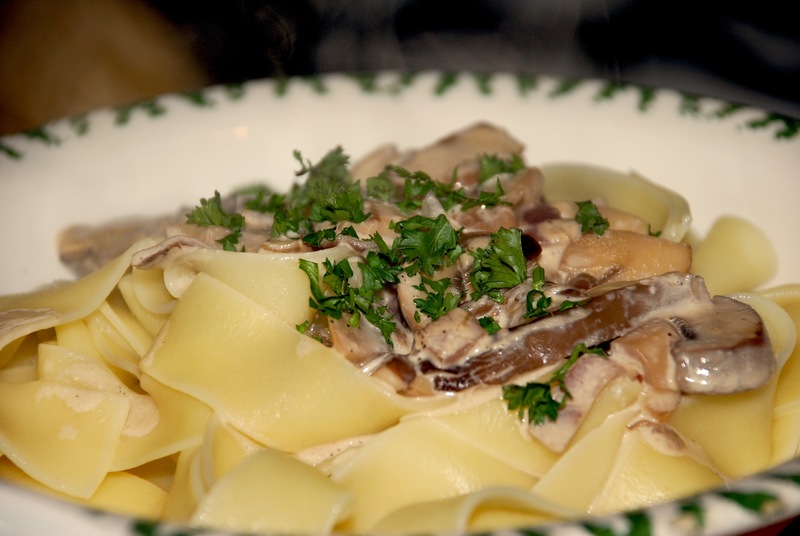 Here’s another easy seasonal dish for you – creamy, vegan, fresh mushroom pasta. When I was thinking about what to cook with my friends Maria and Rike on a really autumnish evening, I suddenly had to think of creamy mushrooms. I haven’t tried a white mushroom sauce since I’m vegan, so we were more than happy in the end that it turned out that delicious. It’s autumn! To celebrate the first grape harvest, it’s common in Germany to drink ‘Federweißer’ at this time of year, a fresh young wine that hasn’t fully matured yet and tastes light and sweet [btw, the German companies ‘E. Vollrath & Co.’ and ‘Weingut Mohr’ do not filter with gelatine, so look out for those]. 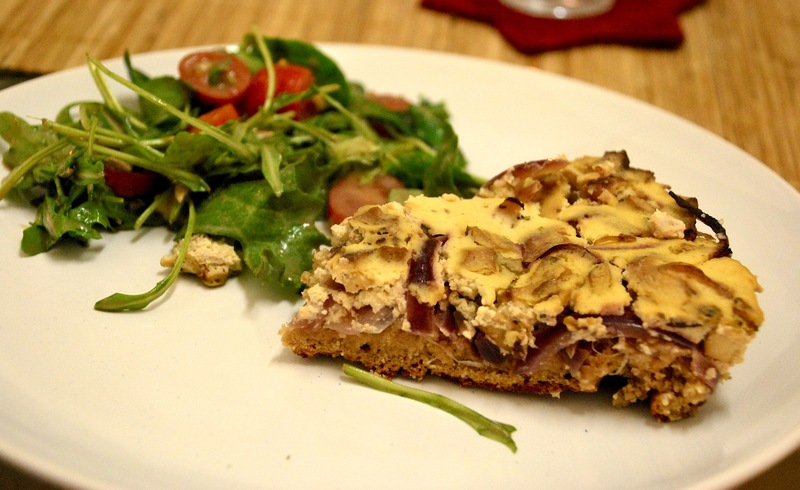 The usual dish that goes with it is Zwiebelkuchen (‘onion cake’), a traditional German autumn recipe usually filled with eggs, sour cream and sometimes bacon. As it’s such a traditional dish, the idea of making a vegan and healthy version was on my mind for a long time. I faced the challenge with my friend Joanna, and as you can see, it worked out ; ) Don’t get frightened by the long ingredients list, it’s still really simple. So grab a glass of Federweißer or grape juice, get in the kitchen and enjoy this savoury delight!